HALF MAN… HALF ANT… ALL TERROR! Directed by the legendary Joe Dante (The ’Burbs), this delightful film isn’t just an affectionate love-letter to the sci-fi and horror films that he grew up with in the 1950s and 60s, it’s also a witty and intelligent exploration of the way that the most successful genre films worked by preying on the very real fears of their audiences about everything from Soviet satellite launches to atomic mutation. 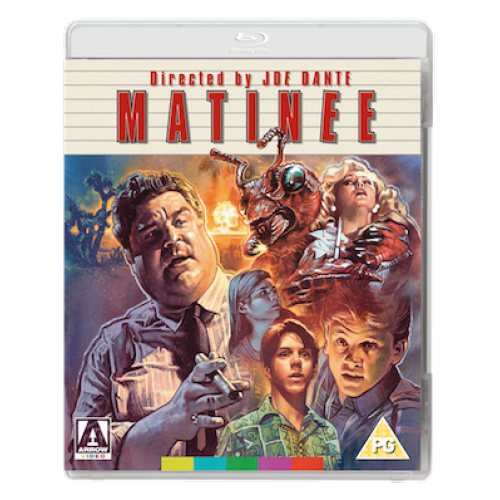 The UK rights for Matinee are in a bit of a tangle, and no plans for Small Soldiers. So it sounds like they've 'untangled' the rights then! Directed by the legendary Joe Dante (The Burbs), this delightful film isn t just an affectionate love-letter to the sci-fi and horror films that he grew up with in the 1950s and 60s, it s also a witty and intelligent exploration of the way that the most successful genre films worked by preying on the very real fears of their audiences about everything from Soviet satellite launches to atomic mutation. Definitely a highlight of the September announcements (though there are another few I'm quite excited about). Yep. Love how writing a Joe Dante film means getting a SAG card, too! I have hearing issues and the French BD which I imported didn't have English subs, so between that and the booklet, it's reason enough for me to double-dip on the Arrow. The film is a masterpiece so I'm thrilled it gets more exposure. Pathe had the UK rights for years, hopefully this being sorted out means that another former Pathe UK title has a better chance of coming out through Arrow - Alex Winter and Tom Stern's Freaked! Needless to say, am very happy about this one. I put on a screening of this film a while back where I dressed in a homemade paper mache Mant costume to terrorise the crowd. Way back in the mid-1990s, I put on a double bill of Matinee and Creature from the Black Lagoon (in 3-D, obviously) which still ranks high as one of the greatest experiences I've ever had in the cinema. The Dante was wonderful, of course (it wasn't a first viewing), and got the audience in just the right mood to very obviously and vocally take the side of the Creature throughout, complete with cheers and applause when he kidnapped Julia Adams and leaped over the side of the boat. JamesF wrote: Pathe had the UK rights for years, hopefully this being sorted out means that another former Pathe UK title has a better chance of coming out through Arrow - Alex Winter and Tom Stern's Freaked! "I'd just like to add one thing-- those who oppose us will stand knee-deep in the blood of their loved ones." Another great and hilarious film desperately in need of a wider audience. The US Blu-ray ported over none of the extensive (exhaustive, really) extras from the long OOP Anchor Bay special edition, Arrow wouldn't even need to produce much in the way of content, just port over those copious extras. I'm always sort of surprised how unknown this film is. It was a huge hit in my family and we had a VHS we wore out where tracking wouldn't even fix it anymore. It's one of my sister's favourite movies and she's not region free, so she'll probably be disappointed by the fact it's locked, but I'm hoping it makes its way over here somehow (I always figured it would be a good title for Criterion, but I'm guessing it's more likely Shout! will pick it up). cdnchris wrote: I'm always sort of surprised how unknown this film is. I've been doing my part, as I've used it quite a few times in history classes and film history classes. It's always gone over great, especially since showing it at the tail end of studying the period means my students always feel a lot of ownership over "getting" many of the period-specific gags and references when they pop up. domino harvey wrote: The US Blu-ray ported over none of the extensive (exhaustive, really) extras from the long OOP Anchor Bay special edition, Arrow wouldn't even need to produce much in the way of content, just port over those copious extras. As for your comment about Pathé, if that is true I wonder if their rights to The Player are now freed up for someone to release (maybe Criterion, assuming they licensed it from Warner Bros and the rights presumably revert back to them). What else is from Pathé though? Black Christmas, The Cars That Ate Paris, Boiling Point, Topsy-Turvy, Hunger? Will the rights automatically revert to Fox, Lionsgate or Film4, or they just there for the taking? I noticed a similar thing is happening with Entertainment in Video at the moment - with their rights expiring and reverting back to studios (e.g. American Psycho, Magnolia, American History X etc.). Might mean we'll start seeing titles we wouldn't have expected to see before. Anyway, I'm especially excited to see Mant! in full, and also watch all the other extras. I notice David Jenkins (Little White Lies) is doing more and more stuff for Arrow - first 3 Women and Waking Life, now Matinee and Raising Cain...basically four of my favourite Arrow announcements! Coincidence, or just common taste? I wonder if we'll get more Universal titles from Arrow now they've announced these two. I wonder if they could get either The Hudsucker Proxy or The Man Who Wasn't There, assuming Universal don't plan to release either themselves (in regards to the latter, they may well port the US disc over here now that EiV's rights have expired). rapta wrote: Anyway, I'm especially excited to see Mant! in full, and also watch all the other extras. I notice David Jenkins (Little White Lies) is doing more and more stuff for Arrow - first 3 Women and Waking Life, now Matinee and Raising Cain...basically four of my favourite Arrow announcements! Coincidence, or just common taste? Anyway, I am very excited for this release. It's the full-length version of what Dante shot. The word "feature" is conspicuously absent from the description, as such a thing obviously doesn't exist. I assumed it would be a short film with an end-to-end plot, and Dante had just cut sequences of it into Matinee to make it appear to be a full feature film. I'll be glad to see the whole thing, as every time it showed up in the film I was grinning ear-to-ear! Or are you saying that every scene of Mant! (the film-within-a-film) shown in Matinee (the film itself) constitutes the entire existing film; that Dante didn't flesh the plot out any further than what was shown? Either way, I'll just be over the moon to see the whole thing, as obviously some of it is heard off-screen or interrupted. New additions in bold. I notice they've taken out 'Discussion with Joe Dante on the effects of Mant!' but I assume the footage from that has been blended into one of the other interviews/discussions. Either that or they ditched it for some reason, which would be a shame, but it would have been for logistical reasons. So it sounds like they had (or will have) a productive trip to visit Dante! He has collaborated with them before (and Eureka too, from memory), so you know you'll get an especially good release when he's involved...especially if it's one of his own films. Just got my copy in and I think there's something hinky with the deleted scenes? The last two (?) scenes seem truncated far beyond what one would expect. The next to last is just Lisa Jakub saying "If you count up all the real people--" which then cuts to the TV and someone saying "Mexico City" and then the deleted scenes end? What the hell? They collectively run 2:27 on my copy, is this right Arrow?